Located at 8th floor of Grand Center Point Service Apartment on Rajdamri road. RarinJinda Bangkok is a branch from RarinJinda Chiang mai. We were greeted by Khun Em the young and outgoing, Assistant Executive Director. He pointed out that RarinJinda is the premium brand under Blooming Spa. There are two branches, One in Chiang Mai the other is where we are now, Bangkok. Rarin meaning the river and Jinda meaning Jewelry and it is also the name of the doctor that oversees all the treatments of the spa. 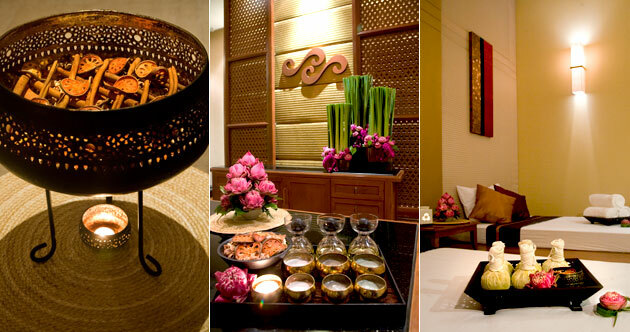 The Chiang Mai branch also is a resort that have wellness programs for their guest. The therapists are all from the northern region, mostly Chiang Mai. There is a training camp there. 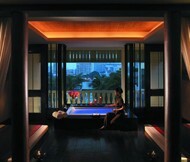 The spa is decorated in modern contemporary style. Water features are used throughout the spa from the hall way to the treatment rooms, there are ponds and running water. Red walls, wooden floor, modern Thai art pieces and the sound of flowing water awaked a deep desire to feel some peacefulness among the hectic day. 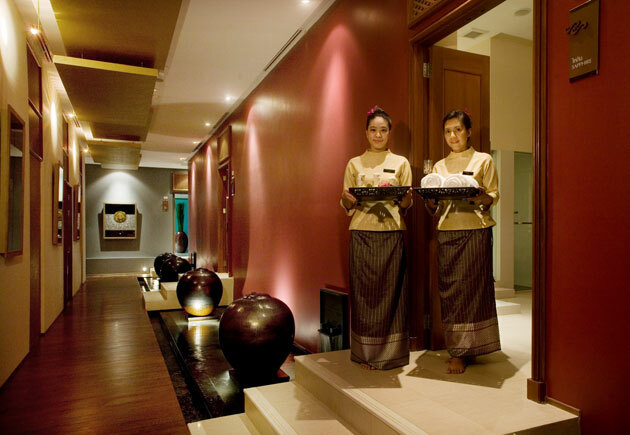 The spa covers 2 floors and has many types of treatments to offer. The treatment rooms are spacious and have many hi tech equipments eg. oxygen while having a foot massage, hydrotherapy tub, vichy shower system, and one we don’t see often, the quartz bed. I was there with two colleagues, we each choose different treatments to share our experiences. Before stepping in the massage room Khun Ple the spa manager brought us 5 variations of aroma oils to choose which are Olive, Refreshing Eucalyptus, Relaxing Lavender, Romancing Orange and the final one is Rose. Khun Vasin choose the hot stone Aroma massage. Boiled hot stones were applied to all parts of the body and they were really hot. It comes in many different sizes for different parts of the body. The large stones were first laid and spread through out on the back on top a towel, without the towels it would be unbearable. While the stone sits still on the back, Khun Nan the therapist worked her fast fingers on the legs and put small stones in between the toes. She then applied oiled stone rubbing it on the legs, back, arms, neck and repeated on the front. The combination of Oil and hot stone really worked, the skin can absorb the oil more under heat, and the heat made the session more intensed and relaxed. The therapist must be very tolerable with the heat, she used her bear hands to handle the hot stones. At some point it seems unbearable due to the heat but hold on just a bit longer the therapist give you some time to recover then start again on other parts of the body. I chose Lavender it had a nice relaxing scent. My treatment was the Aromatherapy Oil Massage. Khun Ruk the therapist began from my neck , hard pressure on my shoulder wasn’t something I’am used to. But I found out that it could relieve some soreness on my body. Followed by treatment to the legs, back,etc. After I told her not to be so strong, Khun Ruk was more gentle which made me feel really comfortable, I almost fell asleep. A sound from stream pot which contained “Lok Phra Kob”, various kinds of thai herbal wrapped tightly in white cloth, made light alarm sound. And that signaled the final part of the massage was coming. The therapist then pressed the warm Lok Phra Kob gently on back of my body, bagan with back then below to the thighs, and calfs. 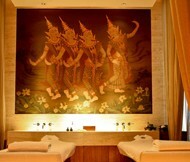 While I was having my massage, P’ Kung was at the quartz bed which is a bed filled with small heated pebbles. It started with a foot bath. Then she was laid face up on the heat quartz bed. The therapist gave her a nice hard massage without oil from the legs and slowly continues to the upper part of the body. After the whole front part of the body was covered, she was sprayed with a rose scented water to cool down. The therapist gave her a rest and a little head massage, it was quite nice. At the end it was quite interesting the part where the arms and legs get stretched like a Thai massage. The heat from the quartz did make the body more flexible. And we were told it does make sleeping problems go away. 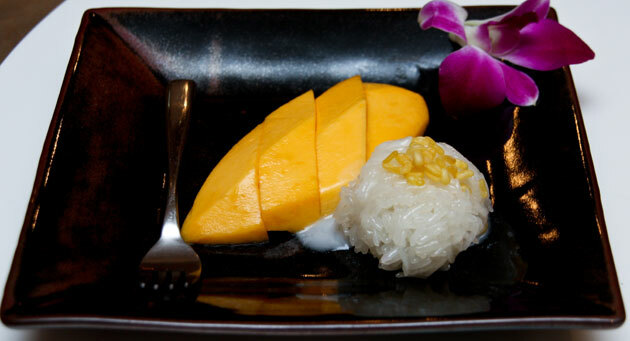 Stepping out from treatment rooms with different experiences all relax refreshed and felt lighter, we all meet at the reception area, we were serve Teuy tea (ชาใบเตย) and sweet sticky rice with ripe mango as a compliment to all guest. A really nice touch. 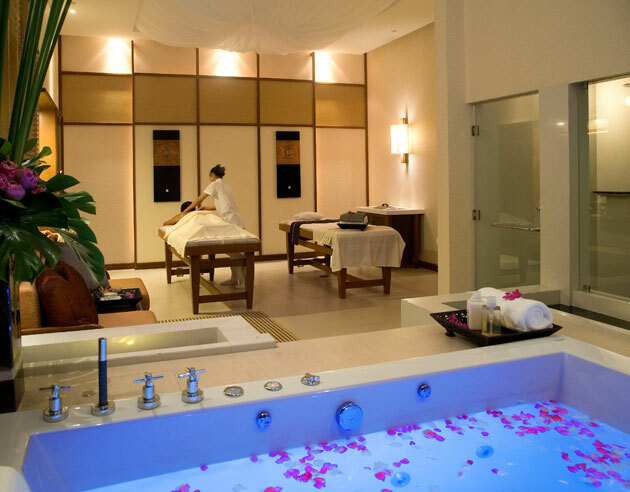 Being from Chiang Mai, RarinJinda does offer a true Chiang Mai experience with an array of treatments that can suit every need.